The campaigning organisation 38 Degrees has adopted a version of 'neutrality' that means kow-towing to a restrictive vision of Brexit. The first part of our debate over what 'neutrality' means in these fractious times. 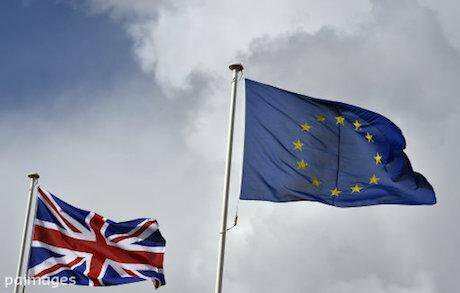 The UK is reassessing the terms of its relationship with the EU. Photo: Toby Melville / PA Wire/Press Association Images. All rights reserved.As the UK faces the turbulence of Brexit, many progressives are finding it difficult to respond. Controversy swirls around Jeremy Corbyn’s call, now apparently withdrawn, for an immediate invoking of Article 50. A more open embrace of Brexit has come, however, from the the crowdsourcing campaign organisation 38 Degrees, which claims to be ‘one of the UK's biggest campaigning communities, with over 2.5 million members’: people who ‘take action’ by voting on online petitions - they don’t pay subscriptions, but “share a desire for a more progressive, fairer, better society”. At the beginning of the EU referendum campaign, 38 Degrees opted for a position of neutrality between Remain and Leave. 230,000 ‘members’, or 9 per cent of the claimed membership, voted, with 52 per cent of these opting for neutrality. The office designed the ‘neutral’ option as using ‘people power to cut through the spin on both sides – and give voters the chance to get the real facts’. By dressing up neutrality as ‘people power’, they steered members towards avoiding a potentially damaging division in 38 Degrees (only 28 per cent of those voting backed Remain and 13 per cent Leave). So this ‘campaigning community’ voluntarily restricted its role to ‘people-powered fact-checks’ on the claims of the rival campaigns - rather in the manner of the BBC whose neutrality is legally prescribed. ‘People power’, incidentally, seems to have been mainly about funding: the fact-checkers themselves were ‘experts’. However within ten days of the narrow referendum vote, the small group of people who run 38 Degrees radically changed their stance, abandoning neutrality. They launched an ambitious programme to “shape a people-powered plan for Brexit’, which they are building through a series of complex questionnaires on the the economy, NHS, trade, rights and immigration. The legitimacy of this ‘DIY Brexit’ is founded on a short, question-begging survey carried immediately out after 23 June, in which the majority of 100,000 respondents (4 per cent of the claimed membership) apparently agreed with the propositions that 38 Degrees should fight for ‘the issues we care about’ and ‘stay out of the debate about Europe’. 38 Degrees’ office clearly believes that arguing about the terms of Brexit, rather than Brexit itself, is justified by these findings. However, it hardly seems that launching a ‘DIY Brexit’ is staying out of the Europe debate. This programme claims to “prioritise fairness, justice and the environment – then campaign as hard as we can to push the debate in the right direction to shape what happens next.” However analysis of the programme shows that it is based on excluding key progressive options for Brexit, notably the option to keep the freedom of movement for UK and EU citizens. Many will have been surprised by 38 Degrees’ original neutrality on Brexit. It seemed anachronistic for an organisation that promotes progressive campaigning on social issues to avoid taking a position on the biggest single decision UK voters have ever been asked to make. It was clear that Brexit could have huge negative consequences for the NHS and many other causes that 38 Degrees campaigns on. Economic, social and environmental experts were almost unanimous in highlighting serious dangers. The strains of 38 Degrees’ neutrality became evident as it became clear that there was no equivalence between the distortions of the two campaigns. While some Remain claims about the dangers of Brexit were exaggerated or dressed up with artificial specificity (although many are now being realised), the Leave campaign was based on direct lies, not only about the cost of EU membership but above all about immigration. Both UKIP, with its infamous poster, and the official Boris Johnson-led ‘Vote Leave’ campaign, with its disgraceful TV adverts, made direct and deceitful appeals to xenophobia. Even before the murder of Jo Cox, it had become very clear that Leave had generated what Corbyn called a ‘well of hatred’. The most generous interpretation of 38 Degrees’ stance was that Brexit involved different kinds of issues - above all national identity - which would cut across normal patterns of alignment among 38 Degrees supporters. If the movement had taken a position for or against Brexit, it would probably have alienated a significant minority. And in a movement that is crowdfunded, the loss of ten or twenty per cent of supporters would have had significant financial implications. However, if these were the motives for neutrality, the position left 38 Degrees playing catch-up over the racist attacks sparked by the Leave verdict. The movement mobilised against the symptoms but not the cause. Theresa May has said that “Brexit means Brexit”, but 38 Degrees seems to be trying to convert it into a kind of ‘Lexit’; that is to say, a ‘left exit’. A case can certainly be made that some sort of Brexit will probably happen, and that we should be trying to shape its terms. However, the obstacles are formidable, which makes 38 Degrees’ precipitate abandonment of any direct challenge to the decision (with a mere fig-leaf of consent from its members) is highly questionable. Even if we concede that the question is now to shape the terms of Brexit, 38 Degrees has gone much further still by excluding key options from consideration. Their ‘DIY Brexit’ turns out to be remarkably constrained on key issues by the tendentious initial positions of the new government: that (according to Philip Hammond) Britain will be out of the Single European Market and that (as Theresa May has claimed) the British people have voted to restrict immigration. Neither proposition was on the ballot paper on 23 June, neither was resolved by the vote, and both remain squarely for Parliament to decide. It is clear that many people voted Leave who do not support one or both of these assumptions. Indeed, at the beginning of the campaign, Boris Johnson did not support either -- even if by the end he embraced Michael Gove’s more restrictive positions. Indeed, there was a rightwards drift in the Leave campaign, in which UKIP’s positions were rapidly adopted by the Tory Leave camp. Theresa May has now acquiesced in the results of this movement. Unfortunately 38 Degrees’ surveys show that not only has it embraced key arguments of the Leave campaign. Like the May government, it is following the rightward drift of Leave in excluding key progressive options for Brexit from consideration by its members. 38 Degrees’ NHS questionnaire asks members to say whether they agree that “Money saved from leaving the EU should go to the NHS - the Vote Leave campaign claimed this would be £350 million per week.” Here 38 Degrees accepts the key Vote Leave premise that the UK will save money by leaving the EU, and that this could be diverted to the NHS. It even implies that the £350 million figure could be valid, although it has been comprehensively discredited. 38 Degrees simply ignores the arguments, strongly made before the vote by the head of NHS England and many others, that there will be no saving for the UK from leaving the EU and no extra funds to divert to the NHS. The charitable interpretation is that the questionnaire’s authors are being too clever, and trying to stoke popular demands for NHS funding even though they know that Leave’s claims were bogus - a disturbing attempt to play on the gullibility of some 38 Degrees members. However the trade questionnaire points to a clear choice by the survey drafters to embrace a restrictive form of Brexit. Although it asks questions about the applicability to the UK of TTIP (the controversial trade and investment deal between the EU and USA) and CETA (the EU-Canada deal), it doesn’t ask the central question widely raised during the referendum campaign, of whether the UK should have a Norway- or Canada-style relationship with the EU. Neither does it allow members to vote on the key issue of whether or not the UK should be part of the Single European Market. The ‘rights’ and ‘immigration’ questionnaires confirm this impression by excluding the most contentious issue in the Brexit debate: the principle of freedom of movement. This is only addressed in a very partial fashion in the second of these surveys. The ‘rights’ survey asks whether members agree with the assertion that, ‘We should protect all rights people have at work, such as sick leave and fair working hours, by enshrining all current EU workers protections into UK law.’ However these are rights which could be unilaterally maintained by the UK unless the government chooses to drop them. Yet the survey fails to ask about the workers’ right which is the most threatened by Brexit: the right to free movement and to work throughout Europe. The loss of this right will affect not just EU citizens wanting to work in the UK, but British citizens wanting to work in Europe. This is the right which will actually be at risk in the EU-UK negotiations. Indeed at the present time, British citizens are also citizens of the European Union. As such, we have the right to go and live in other EU countries, either fully or part of the time, to study or retire as well as to work. We have the right to travel freely. These are broader freedoms of movement which EU membership which Brexit could restrict for UK citizens. The ‘immigration’ questionnaire asks only about whether the acquired rights of UK citizens currently resident in Europe should be maintained, and whether the UK government should negotiate to maintain students’ ability to study in Europe. It doesn’t ask whether these rights should be maintained for all UK citizens, who may wish to reside in Europe in the future. Likewise, on EU migration into the UK, the survey asks only about existing EU citizens in the UK and and whether we should ‘welcome new arrivals with skills to help our economy flourish, e.g. scientists, doctors and engineers’. This survey offers no option to vote for the general free movement of people between the UK and the EU, which a Norway-style relationship would imply. It confirms that 38 Degrees has effectively sold the pass on these essential freedoms. The immigration survey contains another suggestion: that ‘the new system of migration’ (as though it had been decided to have one) “must be subject to democratic approval”, not just by “a binding vote in Parliament” but also possibly by a referendum. If it is possible to imagine a proposition more damaging to the cohesion of British society than the recent referendum, a referendum on immigration must surely be it. As far as I can ascertain, not even UKIP has proposed this. But it surely will once the idea is given currency. Here 38 Degrees is not just embracing a reactionary version of Brexit, but setting its pace. Paul Hilder, a founder of 38 Degrees who personally supported Remain and now runs another crowd-sourced political platform, Crowdpac, has written: “it is crystal clear that the Leave campaigns learnt many of the lessons of new politics, and are well positioned to apply them in the months and years to come. I expect them to make significant use of our platform for crowdfunding and candidate selection.” The 38 Degrees office is showing that its similar platform, supposed to be a vehicle for progressive politics, has already been commandeered to support not just Brexit, but a restrictive version of it. 38 Degrees talks of ‘people power’. However, the power of a small group of unelected people to set the agenda has been very evident throughout the organisation’s relationship to Brexit. The office will claim that at every stage they have polled members, but in this key area they have been shaping and hyping their preferred options, whilst keeping other key options out of play. At no stage have they managed to engage more than 10 per cent of their claimed overall membership in these consultations, or obtained the actual support of more than 5 per cent for their chosen options. Since 38 Degrees membership is nebulous, it’s likely that people who don’t agree mostly switch off or do not respond. 38 Degrees will claim that the surveys represent what their ‘progressive community’ wants out of the Brexit crisis. Yet what ‘people-powered Brexit’ really represents is the moment at which 38 Degrees can no longer be seen as a major home of the progressive community in Britain. This is the first part of our debate. Click here to read the response from 38 Degrees' David Babbs.